It's been a few years since Bryan Gruley had his award-winning Starvation Lake series. 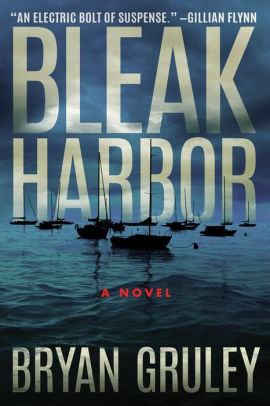 He returns to Michigan, to a new town, in Bleak Harbor, a domestic thriller. When Danny Peters disappears, Carey Peters fears her sixteen-year-old son has run away for a second time. The young man is on the autistic spectrum. He ran away from home the first time when his dog had to be put to sleep. This time, though, Carey and Danny's stepfather, Peter, receive a photo of Danny tied to a chair. Then, the police find one of his shoes and a cell phone. Although Carey's mother may be the richest woman in Bleak Harbor, and maybe in all of western Michigan, she's shown no interest in helping her grandson or daughter. Was Danny kidnapped because of his grandmother's money? Carey and Pete both struggle with their own secrets. They haven't confided in each other, but they each fear Danny may have been taken because of their secrets and lies. The suspenseful story intensifies to a startling conclusion in a story featuring an unconventional, intricate plot. A mastermind is aware of the all of the flawed people involved with the Peters family, and seems to know how to skillfully play the family. Gruley's latest book is descriptive and atmospheric. However, Bleak Harbor is a bleak story about dysfunctional people. If you're a fan of domestic thrillers, give it a try and tell me what you think. As to me, I think the reason I seldom read domestic crime novels is I usually don't like the people involved. I tend to root for the mastermind, rather than the victims. Let me know what you think. Bleak Harbor by Bryan Gruley. Thomas & Mercer, 2018. ISBN 9781503904682 (hardcover), 378p. FTC Full Disclosure - I received a copy to review for a journal. Lesa, I was excited to see that Brian Gruley was writing again because I loved the Starvation Lake books. But now I'm not so sure. If I see this book on the shelves at the library, I will probably pick it up, but I won't go looking for it.I guess the "bleak" in the title should have warned me. Margie, You might like it. As you said, if you see it on the shelf, pick it up and give it a try. Lesa, thanks for the kind review! I loved the Starvation Lake series and was disappointed when it was not continued. This book was a November First Reads selection so I downloaded it to my Fire. I have yet to read it but your review will spur me on when I am finished with the newest Baldacci. Once again thanks for the review and for adding to my TBR pile. You're welcome, Netteanne. I'm always willing to add to TBR piles! It's not my kind of book. When I want sad and miserable I will watch the nightly news. Thanks for the review.